Some people eat their watermelon in triangles, others like it in small balls. Many individuals even eat it in cubes. But for one small toddler, he likes his watermelon from the inside. 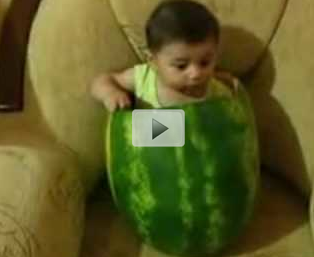 After being placed inside a large watermelon, the young child in this video has a blast eating his watermelon. He won't stop even with the cameras rolling and his full attention is on the delicious treat surrounding him. Take a minute and watch this short clip and see what this child's love of watermelon is all about.